King John (24 December 1166 – 18 October 1216) was the son of Henry II of England and Eleanor of Aquitaine. He reigned as King of England from 6 April 1199, until his death. He became King of England after the death of his brother Richard I ('Richard the Lionheart'). His reign was marked by disputes between John and his barons and bishops. Because of this the nobles forced him to observe the agreement called Magna Carta, to limit his power. The Magna Carta was a significant legal document in English history, as well as the first English “bill of rights”. It introduced the idea that monarchs had limited rights and had to follow certain laws, and it gave the nobles more say in the government. It not only affected English government, but inspired governments of other countries. John's reign as king was important, but not considered successful from England's historical point of view. He tried several times to get back land in France which had been lost, but did not succeed. As the youngest son of Henry II, John could expect no inheritance. 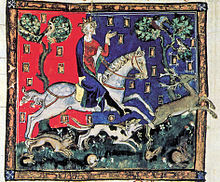 Henry II divided his land among his sons before John was born. Later, John was expected to receive Ireland as a kingdom. Henry’s other sons strongly disagreed with this plan. When Henry died, John’s brother, Richard received all of Henry’s possessions, and John accepted Ireland as a feudal holding from Richard. His family life was tumultuous, as his older brothers all became involved in rebellions against Henry. His mother, Eleanor, was imprisoned by Henry in 1173, when John was about five years old. As a young man, John already had a reputation for treachery. He conspired sometimes with and sometimes against his elder brothers, Henry, Richard and Geoffrey. In 1184, John and Richard both claimed that they were the rightful heir to Aquitaine, one of many unfriendly encounters between the two. John on a stag hunt, from De Rege Johanne. Richard was absent on the Third Crusade from 1190 to 1194. John attempted to overthrow William Longchamp, the Bishop of Ely, who was Richard's designated 'chief justiciar' (like a Regent or Prime Minister). This was one of the events which led later writers to cast John as the villain in the legend of Robin Hood. John was more popular than Longchamp in London. In October 1191 the leading citizens of the city opened the gates to John while Longchamp was confined in the tower. John promised the city the right to govern itself as a commune in return for recognition as Richard's heir presumptive. As he returned from the Crusade, Richard was captured by Leopold V, Duke of Austria, and handed over to Henry VI, the Holy Roman Emperor, who held him for ransom. Meanwhile, John had joined forces with Philip Augustus, King of France. They sent a letter to Henry asking him to keep Richard away from England for as long as possible, offering payment to keep Richard imprisoned. Henry declined their offer, and got his ransom from Eleanor of Aquitaine (who had to pawn the Crown Jewels). Richard was set free. Upon the release, John begged forgiveness from Richard, who granted it and named him heir presumptive. On Richard's death (6 April 1199) John was accepted in Normandy and England. He was crowned king at Westminster on 27 May, Ascension Day. However, Anjou, Maine, and Brittany declared for Arthur of Brittany, son of his elder brother Geoffrey. Arthur fought his uncle for the throne, with the support of Philip II of France. The conflict between Arthur and John had serious consequences for both. Finally, Philip recognised John over Arthur. The price paid was John's agreement to be Philip's vassal in Normandy and Angevin. Nevertheless, conflicts continued until in 1202 Philip declared all John's French lands and territories, except Gascony in the southwest, and immediately occupied them. Philip gave Arthur all the land he had taken from John, except for Normandy, and betrothed him to his daughter Marie. John now needed to fight to get back 'his' land in France. In 1203 John ordered all shipyards in England to provide at least one ship, with the newly-built Portsmouth Naval Base to provide several. He made Portsmouth the new home of the navy. By the end of 1204, John had 45 large ships available to him, and from then on an average of four new ones every year. He also created an Admiralty of four admirals, responsible for various parts of the new navy. During John's reign, major improvements were made in ship design. He also created the first big transport ships. John is sometimes credited with the founding of the modern Royal Navy. As part of the war, Arthur attempted to kidnap his own grandmother, Eleanor of Aquitaine, at Mirebeau, but was defeated and captured by John's forces. Arthur was imprisoned first at Falaise and then at Rouen. After this, Arthur's fate remains unknown, but it is believed that he was murdered by John. Assuming that he was murdered, Brittany, and later Normandy, rebelled against John. John also imprisoned his niece, Eleanor. Through deeds such as these, John acquired a reputation for ruthlessness. In 1203, John exempted the citizens and merchants of Bordeaux from the Grande Coutume, which was the principal tax on their exports. In exchange, the regions of Bordeaux, Bayonne and Dax pledged support against the French Crown. The unblocked ports gave Gascon merchants open access to the English wine market for the first time. The following year, John granted the same exemptions to La Rochelle and Poitou. In June 1204, the fall of Rouen allowed Phillip to annex Normandy and also take parts of Anjou and Poitou. John needed money for his army, but the loss of the French territories, especially Normandy, greatly reduced the state income. A huge tax would be needed to reclaim these territories. He imposed the first income tax, raising the (then) huge sum of £70,000. Pope Innocent III and King John had a disagreement about who would become Archbishop of Canterbury which lasted from 1205 until 1213. When Archbishop of Canterbury Hubert Walter died on 13 July 1205, John became involved in a dispute with Pope Innocent III. The Canterbury Cathedral Chapter claimed the sole right to elect Hubert's successor, and favoured Reginald, a candidate out of their midst. However, both the English bishops and the King had an interest in the choice of successor to this powerful office. The king wanted John de Gray, one of his own men. When their dispute could not be settled, the Chapter secretly elected one of their members as Archbishop. A second election imposed by John resulted in another nominee. When they both appeared in the Vatican, Innocent disavowed (rejected) both elections, and his candidate, Stephen Langton, was elected despite the objections of John's observers. John was supported in his position by the English barons and many of the English bishops, and refused to accept Langton. John expelled (dismissed) the Canterbury Chapter in July 1207, to which the Pope reacted by placing an interdict on the kingdom which meant that no one could receive religious blessings. John retaliated by closing down the churches. He confiscated (on paper) all church possessions, but individual churches were able to negotiate terms for managing their own properties and keeping the produce of their estates. After his excommunication, John tightened these measures and he got plenty from the income of vacant sees and abbeys. For example, the church lost an estimated 100,000 marks to the Crown in 1213. The Pope gave permission for some churches to hold Mass behind closed doors in 1209. In 1212, they allowed last rites to the dying. While the interdict was a burden to many, it did not result in rebellion against John. In November 1209 John was excommunicated, and in February 1213, Innocent threatened stronger measures unless John submitted. The papal terms for submission were accepted in the presence of the papal legate Pandulph in May 1213 (according to Matthew Paris, at the Knights Templar Church at Dover); in addition, John offered to surrender the Kingdom of England to God and the Saints Peter and Paul for a feudal service of 1,000 marks annually, 700 for England and 300 for Ireland. With this submission, written in a document, John gained the support of his papal overlord in his new dispute with the English barons. After settling his dispute with the papacy, John turned his attentions back to France. The European wars ended in defeat at the Battle of Bouvines in July 1214, which forced the king to accept an unfavourable peace with France. The heavy scutage  levy for the failed campaign was the last straw, and when John attempted to raise more in September 1214, many barons refused to pay. The barons no longer believed that John was capable of regaining his lost lands. In May 1215, Robert Fitz Walter led forty barons to renounce homage to the king at Northampton. The so-called 'Army of God' marched on London, taking the capital as well as taking Lincoln and Exeter. John met their leaders and with their French and Scots allies at Runnymede, near London, on 15 June 1215. There they sealed the Great Charter, called in Latin Magna Carta. It established a council of 25 barons to see John kept to the clauses like protection from illegal imprisonment, access to swift justice, parliamentary assent for taxation, and scutage limitations. Because he was forced to seal the charter, John sought approval to break it, from his overlord the Pope. Denouncing it as "not only shameful and demeaning but also illegal and unjust", the Pope agreed. This provoked the First Barons' War. The barons invited a French invasion by Prince Louis VIII of France and Louis accepted the offer of the crown of England as a reward for his support. John travelled around the country to oppose the rebel forces, and directed a two-month siege of the rebel-held Rochester Castle. While a small force arrived in rebel-held London in November, the Scots under their king, Alexander II, invaded northern England. By the end of December, John was leading an murderous expedition in the north, culminating with the sacking of Berwick-upon-Tweed. The French retook Rochester and much of the south, although the royalists held on to Windsor and Dover. With the momentum swinging from John, some of his generals, including his half-brother William Longespée, 3rd Earl of Salisbury, went to the rebel side. By the end of the summer, Louis held a third of the country and had the support of two-third of the barons. In September, Alexander II travelled down to pay homage to Louis at Dover, where the French pretender had being laying siege to Dover Castle. Retreating from the French invasion, John took a safe route around the marshy area of The Wash to avoid the rebel held area of East Anglia. His slow baggage train (including the Crown Jewels), took a direct route across it and was lost to the incoming tide. This dealt John a terrible blow, which affected his health and state of mind. Succumbing to dysentery and moving from place to place, he died at Newark Castle. He was buried in Worcester Cathedral. When King John died on 18 October, 1216 his nine year old son, Henry was too young to rule the kingdom. William Marshal was appointed as Regent to Henry III to make decisions on Henry’s behalf until he came of age. The barons switched their allegiance to the new king, forcing Louis to give up his claim and sign the Treaty of Lambeth in 1217. King John's reign began with military defeats – he lost Normandy to Philip II of France in his first five years on the throne. His reign ended with England torn by civil war and himself on the verge of being forced out of power. 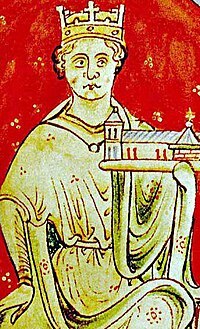 In 1213, he made England a papal fief to resolve a conflict with the Catholic Church, and his rebellious barons forced him to seal Magna Carta in 1215, the act for which he is best remembered. John is responsible for the creation of another English cultural icon, the historic, medieval London Bridge. To finance the construction of a large bridge across the Thames, King John allowed houses, shops, and a church to be built on top of the bridge. John was an efficient ruler, but he lost approval of the barons by taxing them in ways outside those traditionally allowed by feudal overlords. The tax known as scutage became particularly unpopular. John was a fair-minded and well informed king, however. He often sat as a judge in the Royal Courts, and his justice was much sought after. Also, John's employment of an able Chancellor and clerks resulted in the first proper set of records. "...talented in some respects, good at administrative detail, but suspicious, unscrupulous, and mistrusted. He was compared in a recent scholarly article, perhaps unfairly, with Richard Nixon. His crisis-prone career was sabotaged repeatedly by the halfheartedness with which his vassals supported him—and the energy with which some of them opposed him". In 1189, John was married to Isabel of Gloucester. They had no children. John had their marriage annulled, and she was never acknowledged as queen. John remarried, on 24 August 1200, Isabella of Angoulême, who was twenty years his junior. John had kidnapped her from her fiancé, Hugh X of Lusignan. Henry III (1207–1272), King of England. Richard (1209–1272), 1st Earl of Cornwall. Joan (1210–1238), Queen Consort of Alexander II of Scotland. Isabella (1214–1241), Consort of Frederick II, Holy Roman Emperor. Eleanor (1215–1275), who married William Marshal, 2nd Earl of Pembroke, and later married Simon de Montfort, 6th Earl of Leicester. Joan, the wife of Llywelyn the Great. Oliver FitzRoy, (by a mistress named Hawise) who accompanied the papal legate Pelayo to Damietta in 1218, and never returned. Geoffrey FitzRoy, who went on expedition to Poitou in 1205 and died there. John FitzRoy, a clerk in 1201. Henry FitzRoy, who died in 1245. Osbert Gifford, who was given lands in Oxfordshire, Norfolk, Suffolk, and Sussex, and is last seen alive in 1216. Eudes FitzRoy, who accompanied his half-brother Richard, Earl of Cornwall, on Crusade and died in the Holy Land in 1241. Bartholomew FitzRoy, a member of the order of Friars Preachers. Maud FitzRoy, Abbess of Barking, who died in 1252. Isabel FitzRoy, wife of Richard Fitz Ives. Philip FitzRoy, found living in 1263. The surname Fitzroy is Norman-French for 'son of the king'. John is also famous for his part in the Robin Hood stories where he plays one of Robin's enemies. Popular culture suggests that many people did not like him, but actually we do not know what ordinary people thought in the 13th century. ↑ "King John, of England." Historic World Leaders. Gale, 1994. Biography In Context. Web. 27 Feb. 2013. ↑ Watts, Tim. 2013. King John. World History: ancient and medieval eras, ABC-CLIO. ↑ 'Heir presumptive' = John was next in line for the throne. ↑ Haines, Roy (2004). Oxford Dictionary of National Biography: John de Gray. Oxford University Press. ↑ An interdict against a country was the equivalent of excommunication against an individual. It would cause all the churches to be closed, and almost all the sacraments to be disallowed. ↑ Poole, Stephen (1993). "King John and the Interdict". From Domesday Book to Magna Carta 1087–1216. Oxford History of England (2 ed.). Oxford, England: Oxford University Press. pp. 446–447. ISBN 0-19-285287-6 . ↑ 9.0 9.1 Harper-Bill, Christopher (1999). "John and the church of Rome". In Church, S. D. King John New Interpretations. Woodbridge, England: Boydell and Brewer. pp. 306–7. ISBN 0-85115-736-X . ↑ "Knights Templar Church at English Heritage website". English-heritage.org.uk. http://www.english-heritage.org.uk/server/show/ConProperty.194. Retrieved 2010-05-02. ↑ Church, Stephen (1999). The household knights of King John. Cambridge, England: Cambridge University Press. p. 66. ISBN 9780521553193 . "As an accurate account of an event the story has little value"
↑ Scutage: in the law of England under the feudal system, this allowed a knight to 'buy out' of military service due to the Crown. Its name derived from the knightly shield (in Latin: scutum). ↑ Given-Wilson, Chris (1996). An Illustrated History of Late Medieval England. Manchester, England: Manchester University Press. p. 87. ISBN 0-7190-4152-X . ↑ Child, G. C. (9 May 1857). "Medical History of the early kings of England". Medical Times and Gazette (London) 14: 457. ↑ Hollister, Charles (1998). Medieval Europe: a short history. New York: McGraw-Hill. p. 256. ISBN 0-07-029729-0 . This page was last changed on 22 October 2014, at 07:46.